Many hands work together at medi to make up compression garments – as is shown here, taking mediven elegance as an example. 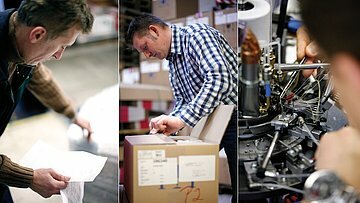 Production runs as smoothly as clockwork, with the various production stages in each department slotting into each other like cogwheels and showing once again what's behind "Made in Germany": real teamwork. It's a fascinating process, the journey from yarn to stocking. We here at medi hope you will enjoy your "virtual guided tour around our stocking production area". The "raw materials" arrive: as soon as the yarn arrives, Ercan Yildirim takes a close look at the consignment, inspecting it meticulously: are the goods all there and in perfect condition? Does the delivery slip tally with the goods? Only then are the goods signed off and entered in the inventory program. All there? Everything OK? Each box has to pass Matthias Exner's visual inspection before he gives the green light and the yarns are transported to the knitting hall. Only the very best "ingredients" are approved for stocking production. Off to the round knitting hall this is when the yarn becomes a stocking. The yarn is threaded onto the knitting machine's round knit cylinder. This needs a steady hand and plenty of fine motor skills – precision work before the knitting even starts. 4,500 stiches per second: the speed at which the threads circle the knitting cylinder makes them unrecognisable to the naked eye. 6.4 minutes later: the mediven elegance "stocking tube" drops into the hopper; it has an "open toe", which still has to be finished off. All round knit stockings are knitted in white. The garments don't get their final appearance until they have been dyed. 910,888 stitches later: two sample stockings have to pass the longitudinal and transverse stretch tests before the machines start making up the order in earnest. The perfect mesh structure: Barbara Küfner now pulls the stocking lengthwise over the inspection board. Her practiced eye immediately recognises any irregularity that may have crept into the mesh structure, for example, if the compression yarn is coming to an end after 30,000 metres or if the knitting yarn is beginning to run out after 100,000 metres. There are no compromises in terms of quality – anything that's not perfect is rejected. Temporary storage: Andrea Müller now deals with the temporary storage of the stockings. 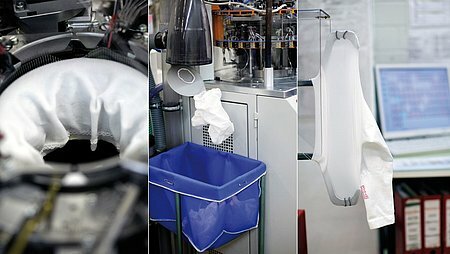 The production operating system automatically consigns her a storage site until the stockings are moved to the finishing department for further processing. Closing off the toes: Valentina Gergert closes off the toes of mediven elegance stockings by eye with the sewing machine, sewing them in a semi-circle form. This needs a steady hand and a great deal of experience – something she shares with all her colleagues. The next inspection: another inspection phase: Inge Neubig pulls the mediven elegance over the inspection board and minutely inspects the mesh structure, the heel and the toe. Preparing the topband: Gülcan Tas uses the machine to cut the topband to length. She threads the topband strip into the machine and enters the length and number of topband sections she needs. Particularly important: the cut edge has to be absolutely straight for the next production stage. Sewing the topband together: Kerstin Fraunholz sews the ends of the topband together. She matches up the cut edges exactly flush with each other and "binds" the topband. She cuts off even the tiniest loose thread with a pair of sharp scissors. This is perfection to the tiniest detail for mediven elegance. Sewing on the topband: Akbay Deniz sews the topband exactly edge to edge onto the compression stocking. Because there is no overlap, the transition from the topband to the stocking is inconspicuous – even under tight clothing. The topband seam is now over the back of the leg exactly in line with the heel. The elastic seam follows the wearer's every movement. Every loose thread – no matter how tiny – is carefully snipped off. Handicraft is indispensable here at medi. 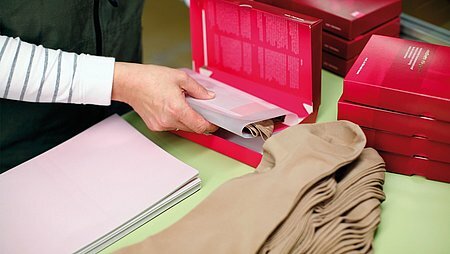 Making the labels: Heike Schönauer makes the labels, which include all the details of the stocking (size, length). 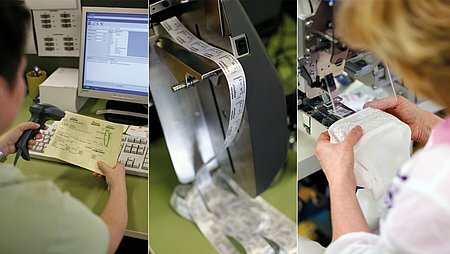 Printing the labels: the labels are printed on an endless textile reel and enclosed with the stockings. Sewing the labels in: Claudia Wenig feeds the row of labels into the special sewing machine. The stocking is now pressed against the label, which is then automatically sewn in and cut off. The stocking now has its very own personal "ID card". Now to the dyeing and the finishing touch: this is where the mediven elegance stocking becomes colourful. Elisabeth Werner first inspects the stockings and stacks them up. And off into the dyeing machine: then the stack of stockings is placed in the dyeing machine. The dye mixture is poured in, the machine is programmed and started. It is checked by Jochen Bauer several times during the dyeing process. The dyeing machine is running. The running time depends on the colour: pale colours are finished sooner than dark shades. Environmentally-friendly dyeing: the dye is so harmless that it can be run off directly into the wastewater system. The stockings are then washed, dried and laid out. The machines are heated by steam from the drain water heat recovery system. And yet another inspection: before the compression stocking is popped into the box, Christina Trebes checks the length of the stocking and the details on the label. Information material: all the information that the patient needs to know is now packed in the box too. The compression stocking is folded and wrapped in tissue paper together with the information leaflets (Instructions for Use, mini medi Info). Well packed: the mediven elegance compression stocking has almost reached its target at medi: the new high-quality stocking carton in its medi design. Ready for its first meeting with the patient. Ready for the long journey: the stocking cartons are first stored in our magenta boxes. The box is covered to protect the cartons. Rainer Hacker scans the data on the box, the inventory in the operating system is automatically updated and the stocking is put into storage until it is ordered. 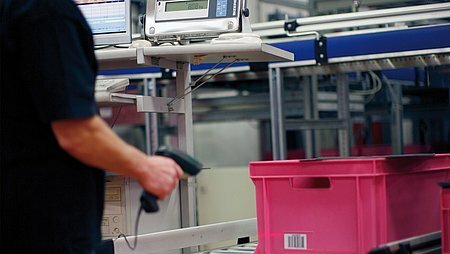 Lightning-fast deliveries: most orders leave medi the next working day. Thus medical retailers, e.g. surgical appliance retailers, can provide their clients with the individually measured compression garments within the shortest period of time. The sales assistant shows the client how easy it is to put the mediven elegance stockings on – if you know how. At long last on the leg: so now the stocking is where it belongs. It not only gives the patient that feeling of well-being, but also attracts attention and guarantees a Wow effect. Many thanks to all our colleagues in medi's production department for their cooperation. The colleagues we named were acting on behalf of their teams in our production department, who do the same work.